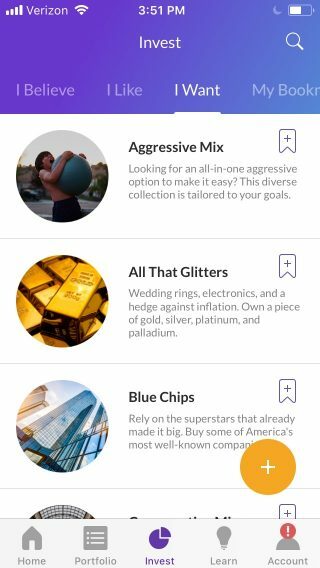 Stash simplifies the process of selecting investments with an app suited for beginners. But fees are steep compared with competitors. The Bottom Line: Stash teaches beginners how to manage their portfolio, but its fees are comparatively steep. High fee on small account balances. Investment app Stash aims to make the process of finding and selecting investments — specifically exchange-traded funds and individual stocks — easy and approachable for beginners. The service repackages existing funds into easy-to-understand themes based on risk tolerance, goals, interests and values, plus offers access to individual stocks. Stash doesn’t manage investor accounts directly, but rather helps guide investors through the process of building an ETF portfolio. The service requires $5 to start investing, and charges $1 a month for account balances under $5,000 ($2 per month for retirement accounts under $5,000) and a 0.25% annual fee for accounts with $5,000 or more. Stash waives its fee on retirement accounts for anyone under age 25. Stash also offers an online bank account and cash-back debit card, with rewards available at about 7,000 merchants nationwide. The account has no minimum balance requirement or overdraft fees. Investors who want guidance selecting investments. Investment guidance: Stash’s goal is to help beginners learn how to invest, and that’s what it does best. The app asks new account holders a few questions to determine risk tolerance and goals. It serves up a list of suggested ETFs, narrowing the options to those that make sense for the user’s financial situation. The app notes which investments should serve as the foundation of the portfolio — the largest slice of the user’s asset allocation — and which should be considered a complement. The user is responsible for building a portfolio out of the suggestions, but the app's Stash Coach feature will nudge back or serve up educational content if it notices a lack of diversification. Stash offers individual stocks, too. About 150 are available on the app, including Amazon, Apple, Facebook and General Electric. Stash offers fractional shares, which means that even with just $5, you can own a piece of a company that has a much higher share price. A quick, snappy synopsis of what the investment is all about. A bar visualization that represents the level of risk. The ticker symbol, last price and, for ETFs, the expense ratio. A list of the investment’s holdings. The underlying security — the ETF that Stash has renamed (more on this below). Users can then dive deeper into performance, and a social component provides insight into who else with the same risk profile owns each investment. The app allows users to link their contacts or Facebook account, if they wish. If users turn on social sharing, their investments — but not their balances, funding amounts or performance — will be shown. There are question mark symbols that launch quick definitions or explanations. A section of Stash is dedicated to educational content, tailored to users based on the information they plugged in when getting started. Thematic and mission-driven direction: Stash renames the ETFs to better reflect their holdings. For example, the SPDR S&P BioTech ETF is called Modern Meds and the Vanguard Small-Cap ETF is called Small but Mighty. Rate Hike Refuge invests in the iShares Floating Rate Bond ETF, which aims to protect investors from interest-rate risk. The ETFs are then further divided into three categories: I Believe, I Want and I Like. I Believe investments are exactly what you’d imagine — mission-driven themes designed to guide users toward investing with their hearts. For example, Clean & Green is clean energy, via the iShares Global Clean Energy ETF. Do the Right Thing is socially responsible companies, via the iShares MSCI USA ESG Select Fund. Equality Works is companies that support LGBT employees with equal rights, via the Workplace Equity Portfolio ETF. The I Want category is designed to align with investing goals. Examples are Park My Cash and Aggressive Mix. The I Like category is dedicated to things users might, well, like, including Retail Therapy and Internet Titans. Thematic investing in general isn’t new, and the approach is similar to that of Motif Investing, though with far less work on the part of Stash. Motif pulls together baskets of up to 30 stocks or ETFs around a theme or trend, rather than simply renaming existing ETFs. Low account minimum: All it takes is $5 to start investing with Stash, a reasonable minimum for even the greenest of investors. That low minimum is made possible by fractional shares: Stash buys the ETFs and stocks, then splits them among its investors. That means you can build a diversified portfolio with very little money. Stash also has a tool to motivate users to invest additional money. Users can quickly adjust a slider to indicate their monthly deposit and growth potential, or anticipated investment return, and the app will show how much the user could have after one year, five years and 10 years. Automated features: If you like the idea of investing without too much effort on your part, Stash will round-up your purchases to the nearest dollar and, once those round-ups hit $5, will send that money to your investment account. The app also offers a SmartStash feature that analyzes your bank account’s ebbs and flows and, if it finds some extra money in there, will sweep it into your savings. Custodial accounts. Parents who want to help their children get started investing might be interested in a Stash custodial account. That said, they should consider the fees and expense ratios we detail below. Wealthfront, a robo-advisor, also has a 0.25% management fee, but NerdWallet readers get their first $5,000 managed for free. This service will build your portfolio, rebalance it and apply tax-loss harvesting on taxable accounts. Acorns, likely Stash’s chief competitor, is a robo-advisor app that rounds up transactions in linked bank and credit card accounts, then invests them in a managed ETF portfolio. It charges $1 a month ($2 per month for retirement accounts) for rounding up transactions and ongoing investment management, including rebalancing. Once you’ve built your portfolio, Stash isn’t involved in managing it the way a robo-advisor would be, though the company is a registered investment advisor and a fiduciary. The app will, however, provide an evolving library of educational resources and maintain a list of suggested additional investments based on your risk profile and existing portfolio. It also makes it easier to find investments that align with your values. ETF expenses: The ETFs available through Stash have an average expense ratio — the annual fee charged to investors — of about 0.30%. That’s high compared with the ETFs curated by robo-advisors; most services are heavy on Vanguard’s very low-cost funds. To be fair, Stash brings more niche funds into the mix, specifically in its I Believe category. Thematic investors are often willing to pay more to invest in causes or companies they believe in. Transparency: The signup process isn’t the most investor-friendly, though it also isn’t hard. You’ll need to input vitals and financial details into the website or app, the same as you would for any other “brand-name” brokerage. After signing up, the company sends a text message to download its app, or you can download it directly from an app store. As part of signing up, the app asks you to commit to a regular deposit amount, though you can immediately opt out of that amount. This request occurs before you even know the potential investment options or what they cost. Stash’s website is light on information when it comes to the available investments or their expense ratios — we’d prefer to see a list of investment options prior to signing up and sharing personal information. »Want to compare more providers? Check out our top picks for best robo-advisors. If you’re looking for a little hand-holding while you build a portfolio of ETFs and individual stocks, Stash may be a good fit. That kind of educational assistance may save money in the long run — you’ll avoid costly mistakes and learn how to manage your own portfolio. Stash also provides access to fractional shares, allowing you to diversify with very little money. For younger investors — under age 25 — Stash's no-fee retirement accounts might be a nice incentive to get started on retirement savings (keep in mind that you'll still pay the underlying investment fees for the ETFs you invest in). But once you’ve learned the basics and/or celebrated your 25th birthday, you may find that you’re unlikely to get much more in exchange for Stash’s ongoing monthly fee. At that point, it’s a good idea to explore branching out on your own. There’s no fee to close or transfer funds out of your Stash account. Interested in other brokers that work well for new investors? See NerdWallet’s rankings of the best brokers for beginners.